1 What is a rice cooker and how does it work? 2 What are the benefits of using a rice cooker? Cooking rice is notoriously difficult to get right, and anyone who has tried is very likely to tell you the same. For something that seems so simple to cook, it can so easily go wrong. However, there are actually options that can help you to achieve the perfect rice every time. One of these options is the rice cooker. The rice cooker first made an appearance on the market in the1950’s in Japan, where rice is a staple food. These days, they can be found in both home and commercial kitchens all over the country. To put it simply, the rice cooker transfers heat from the heating plate to the metal pan that contains the rice. The water in the rice cooker will stay at a stable temperature until the grains of rice have absorbed all of the water. The cooker will pick up when all of the water has been absorbed, and then reduce the temperature to simply keep the rice warm. It is as simple as that. What are the benefits of using a rice cooker? What many people may not realise is that there are actually a lot of different ways in which you can benefit from using a rice cooker, whether that is in your kitchen at home, or your commercial kitchen. Here are a few of the ways in which you can benefit. No risk of over cooking or under cooking – The problem with cooking rice is that it is so easy to either under cook it or over cook it. If you over cook it, you are going to be left with sloppy rice that doesn’t taste very appealing at all. If it is under cooked, then you are going to be left with rice that is crunchy; again, not very appealing. With a rice cooker, there is no risk of either of these things happening. Cook different types of rice with ease – Different types of rice have different cooking requirements. There are actually a lot of different types, from sushi rice to basmati rice, and many in between. Unless you are experienced with cooking different types of rice, it is going to be hard to get right. Most rice cookers will have different options for different rice types, so you can get it right every time. Cook rice in large batches – If you have a big family, or you are looking for a rice cooker for your commercial kitchen, then it is likely that you are going to want to cook rice in large batches to save time. This can be quite difficult when you only have pots and pans to work with. 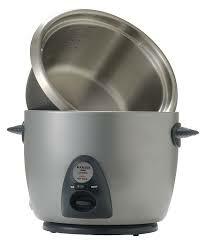 By using a rice cooker, you are able to cook rice in large batches with ease. If you have never used a rice cooker before, then the prospect can be quite daunting. Whilst it is generally easier than cooking rice using pots and pans, it can still be hard to get your head around at first. Here are a couple of tips that will help you to get it right. One of the problems that a lot of people face, when it comes to cooking rice, is getting the water to rice ratio right. This is one of the most important aspects of cooking rice. The good news is that most rice cookers will come with a dedicated measuring cup to help you to get it right. If you want to make sure that you get the perfect rice, then it is important that you use the cup every time. If you want to make sure that your rice is not only cooked to perfection, but also tastes amazing, then you are going to need to make sure that the rice cooker is cleaned thoroughly after each use. The last thing that you want is bacteria lurking around in the cooker. In order to make sure that your rice has the perfect taste and texture, it is wise to make sure that it is not kept warm for too long. It can become stale quite quickly and this will change the taste as well as the texture. As you can see, rice cookers are a fantastic addition to any kitchen, especially if you cook with rice on a regular basis anyway. There are some great budget rice cookers online at the moment, so whatever budget you are working with, you should be able to find the right rice cooker for your kitchen. Once you use it once, you are sure to be using it on a regular basis.